Growing up, Silvio Denz, majority shareholder and chairman of Lalique Group S.A., developed an appreciation for fine art and craftsmanship through the family’s fragrance and cosmetics company and exposure to his father’s collection of art and fine wine. Following studies in finance and marketing in Switzerland and the US, the Swiss entrepreneur quickly learned business and in 1980 took over the family company, growing it considerably over the next 20 years. Fine wine regularly made an appearance at the dinner table for Denz and his brother to try, particularly the great Bordeaux producers that his father favored. From here, Denz began collecting, and today owns some 40,000 bottles, a collection which his hotel Villa René Lalique in Alsace calls upon for its two Michelin starred restaurant. The Villa, built by René Lalique in 1920 was renovated and reopened in September 2015, with sophisticated craftsmanship and flair paying homage to the Lalique family ethos. 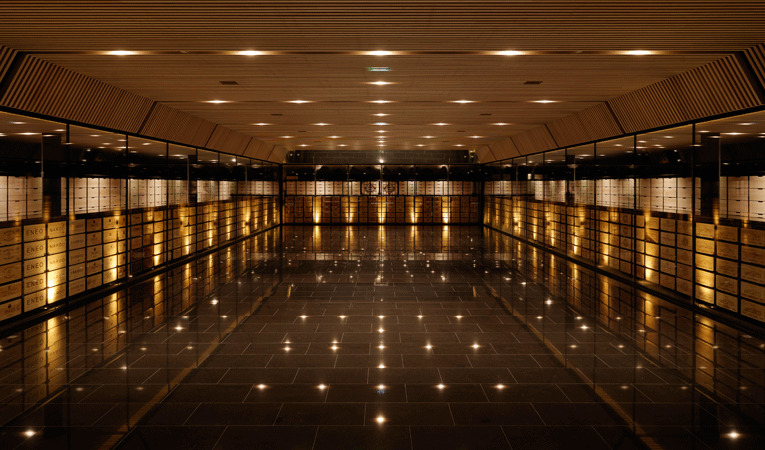 Encompassing the French Art de Vivre, Villa René Lalique also features an impressive wine cellar designed by acclaimed architect Mario Botta, and the entranceway is embellished with artworks by Damien Hirst. More than 20,000 bottles are held in the cellar, largely wines from Bordeaux, including vintage Yquem dating back to 1865, and a great selection of American wines. In addition to his bottle collection, Denz also owns several vineyards across Bordeaux, Tuscany, and Spain. His business endeavors don’t stop there, and further stretch to fragrances, crystal, jewelry, art, real estate, hospitality, and interior design. His collaborations with creative icons such as Tom Ford, Sir Elton John, and The Macallan whisky, enhance the brand, and keep it relevant. It’s safe to say Denz has successfully fused his passion for “the art of living with his various business ventures. Never standing still, Denz is on the cusp of launching a new luxury hotel and gourmet restaurant at Château Lafaurie-Peyraguey in Sauternes, France, neighboring Premier Cru Château d’Yquem. After my studies and after working in finance and marketing in Switzerland and in the USA, I began my career in my family’s fragrance and cosmetics business in 1980. Twenty years later, I owned a chain of 120 perfumeries in Switzerland, which I sold to Marionnaud, Paris, in 2000. In the same year I founded Art & Fragrance S.A. (known as Lalique Group today), specializing in creation and marketing of fragrances worldwide. In 2008 Art & Fragrance S.A. acquired Lalique. When did you first form a passion for wine and fine wine? A passion for wine is in my family’s DNA. My father was a great lover of wine, particularly of Bordeaux, and my brother and I, when we were teenagers, discovered wine at the dinner table. We have a small family wine estate on the bank of The Rhine in Switzerland. I used to work in the vineyard there. Wine making is a real work of art. I like to discover many different varieties and blend them with our winemakers at my wine estates. What led you to branch out to other industries? Savoir-faire and savoir-vivre – the art of living – is all about lifestyle. Art, tableware, fine dining, great wines are inextricably linked – as are perfumes and jewelry, part of the heritage of Lalique. Art and architecture has always been my passion. My father was a great art collector. At home we were surrounded by art. He was also a wine aficionado, he liked great Bordeaux wines; reason why I developed a passion for wine, as well. Why did you decide to invest in the wine industry? My wine activities include seven vineyards in France (Bordeaux), Italy (Tuscany) and Spain, producing more than 600,000 bottles per year, two wine trading companies and an auction house, with more than 60 employees in four countries. A classified vineyard in a famous appellation, such as Saint-Émilion or Sauternes in Bordeaux is gaining value by the quality and the reputation of its wines. To this effect, a vineyard is also an investment in real estate. Located in the village of Bommes and a direct neighbour of the legendary Château d’ Yquem, Château Lafaurie-Peyraguey, is probably one of the finest examples of French vineyard architecture and blessed with a top quality terroir. I acquired Château Lafaurie-Peyraguey, in 2014. My vision is to open a Relais & Château, a five-star hotel of the highest order, the only one at a First Growth Estate of 1855, in 2018 for the Château’s 400 years anniversary. Villa René Lalique calls upon your wine cellar for its wine list. Can you describe your collection? Yes indeed. 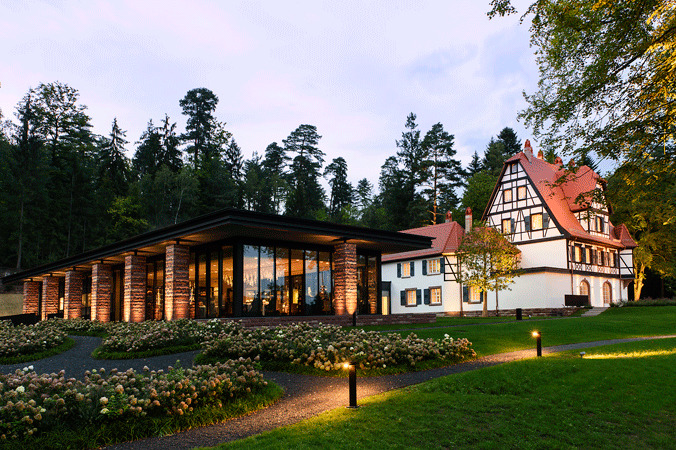 Villa René Lalique’s wine list has about 60,000 bottles and 2,500 different labels. Parts of them come from the Denz family collection, some from my father’s cellar. They have been stored under perfect conditions for many decades. There is a wide selection of Bordeaux wines, notably some century-old Sauternes, but also a large variety of wines from Alsace, from Burgundy, from the Rhone Valley, from Italy, from Spain and from the USA. It’s a relaxed evening, what bottle of wine do you choose to enjoy? All depends on my personal mood and the season. The choice is often very spontaneous: a rosé wine in the south of France in summer or an old Bordeaux in front of a fireplace at one of my wine estates in France in winter. Lalique is a symbol of living artistic tradition and craftsmanship, the jewel in the crown of the French glass and crystal industry. In the life of a company it is vital to keep moving forward and adapting to the change of time, without forgetting our history and heritage. We are building a bridge between the past and the future. We have multiple projects in our pipeline, covering all six pillars of Lalique’s business: jewellery, crystal, fragrances, interior design, furniture, art and hospitality. Launches are on-going, almost on a monthly basis. Lalique is transforming from a crystal manufacturer to a lifestyle brand. For 2018 a major strategic partnership has been announced with Singapore Airlines (SIA). Lalique will become synonym of SIA’s First Class for the next 10 years to come.